Weigh myself every day. Nothing about losing weight, just about recording it. I am simply recording my weight on a normal set of bathroom scales at roughly the same time each day and immediately adding the data to the Withings app on my phone, which I already had because I have a Withings Activité. 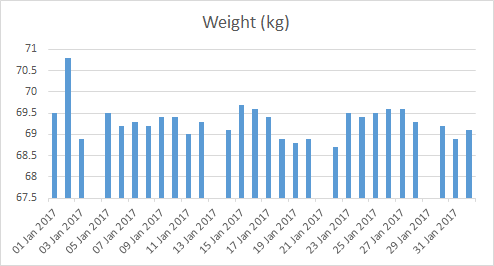 I am a pretty steady 69kg, with small peaks after each weekend. Whether this brings about any change in diet or exercise is yet to be seen. In the meantime, I’m just going to keep recording the data.